Who has the real leverage at the NAFTA table? WASHINGTON -- From day one, President Donald Trump has imposed his will on talks to overhaul the North American Free Trade Agreement. But as his administration tries to seal the deal, it’s not clear he holds all the cards. Trump’s repeated threats to pull out of the pact have kept Mexico and Canada on their heels. The president may still brandish the threat of withdrawal to push a deal through Congress. Yet Canada does have some leverage as it decides whether to join a tentative U.S. deal with Mexico. Meanwhile, any deal Trump signs then requires congressional approval, and the Democrats are favored to seize control of the House in November, making approval far from a foregone conclusion. Trump is the reason the negotiations are happening in the first place. He demanded a rewrite, and he set the tone with a series of proposals designed to reduce the U.S. trade deficit, especially the large shortfall with Mexico. 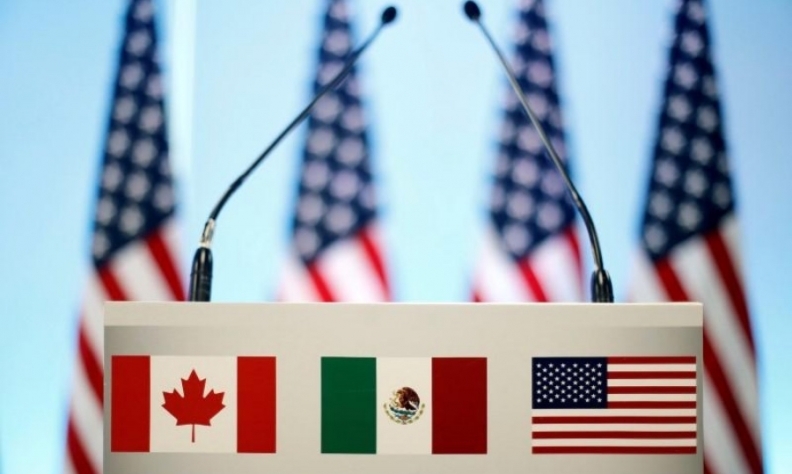 When talks stalled earlier this year, the Trump administration employed a classic divide-and-conquer strategy, focusing on talks with Mexico and leaving Canada on the sidelines. The result was a preliminary deal with Mexico. The U.S. is trying to convince Canada to join the party, keeping the three-way structure of NAFTA intact. But Trump has made clear he’ll sign a deal only with Mexico if necessary, and he has threatened tariffs on Canadian-made cars if it can’t strike a deal. The clock is ticking: Trump has given notice to Congress that he’ll sign a new trade deal with Mexico -- and Canada “if it’s willing” -- by the end of November, and his officials have to present text of the agreement to U.S. lawmakers by the end of this month. Canada may be the David to the U.S. Goliath, but it has proven to be a tenacious negotiator in the past, and it’s standing its ground on NAFTA. The U.S. said it wanted a deal by Aug. 31, so that outgoing Mexican President Enrique Pena Nieto could sign the agreement before his successor, Andres Manuel Lopez Obrador, takes office Dec. 1, thus insulating the new president from the political risks of a new trade accord. But Trudeau called Trump’s bluff, and negotiations with Canada continue. One key advantage for Trudeau: the math on new auto rules may depend on Canada’s inclusion. The U.S.-Mexico proposal requires at least 40 per cent of cars in the trade zone be made by workers making US$16 per hour. Adding Canada’s relatively well-paid autoworkers would make it much easier to meet that threshold. Trump’s plan may be to lure auto plants to the U.S. from Canada. But for now, automakers and unions are pushing for Canada to be brought into the fold. Lawmakers on Capitol Hill, including members of Trump’s own Republican Party, share that view, which puts pressure on Trump to strike a deal with Canada, said Edward Alden, a senior fellow at the Council on Foreign Relations in Washington. “The U.S. and Mexico have said they will go it alone, but Congress has made it utterly clear that a U.S.-Mexico only deal is D.O.A. on the Hill,” said Alden. U.S. Trade Representative Robert Lighthizer has expressed optimism that the deal he’s negotiating could win broad support in Congress. Certainly, there are some aspects of the new accord that Democrats can hail as a victory, including the first minimum-wage provision in a U.S. trade deal. Republicans can argue they saved Nafta from the trash can of history. But because of the legal hoops the administration has to jump through, it’s unlikely NAFTA 2.0 will be put to a vote until next year, when the political climate may be very different. Polls indicate the Democrats will take the House in the midterm elections in November. They will be looking to wound, not support, a president that their base abhors. Even though Mexico agreed to a new deal with the U.S., it’s still only a “preliminary agreement in principle,” and Mexico could easily walk away. Lopez Obrador has signaled that his administration will govern pragmatically, but he is still a maverick who campaigned against the establishment and espoused left-leaning policies. If a new NAFTA turns into a political liability, he may be inclined to scuttle a deal.